It wasn't long ago that this would have sounded like a thought verging on insanity. After joining the Big Ten, the Gophers beat Penn State 13 times over the span of the first 16 meetings. 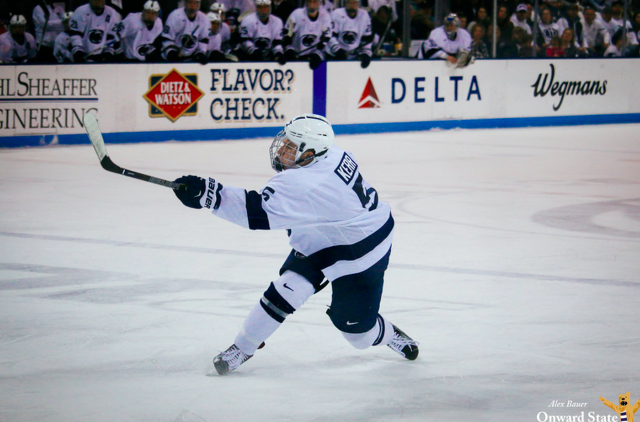 Scoring a goal, let alone goals in the plural, was regularly a challenge and routinely something that simply didn't happen for the Nittany Lions. But as the years went along Penn State continued to find itself as a program on bothe ends of the ice. The games got closer, the outcomes less than a formality. Somewhere in there the edge was that of historic and past accomplishment and not much more. Four-straight wins by Penn State to close out the 2017-18 season effectively erased any notion that these programs were different beyond their Wikipedia pages. Minnesota still had the history, and the better of the series, but not by much, and yesterday doesn't matter nearly as much as today. And today, Penn State left little room for doubt about which direction the momentum in the series is headed. It started with Liam Folkes, just 2:28 into the game as the pucks bounced Penn State's way. And then Alex Limoges, strong on the puck to put Penn State ahead 3-0 after 20 minutes of play. The second period has been Penn State's weak point in the past, but Cole Hults tapped in a backdoor pass from Biro to make it 4-0. The route was on, if that was even still in doubt. Chase Berger added a tally of his own eight minutes later as Penn State held the puck in the offensive zone for what felt like shift after shift. It was dominance, the score was 5-0, emphatic in its own right, but this was as mental as it was physical. Tyler Sheehy would put Minnesota on the board, but Limoges' second of the night ended any thoughts of an already improbable comeback, even as Sheehy added another 19 seconds into the third. All told Penn State fired 42 shots on goal, while Peyton Jones was called on to make 24 saves for a fairly straightforward night of work. The Nittany Lions improve to 15-10-2 on the year and look the part of a team that has found itself again after a week off, trying to right a ship that has listed in every direction but the right one as of late. How seriously one should take this late-season resurgence and Penn State's rediscovery will be determined in part on Saturday night. Another convincing win, and all bets are off.